Anyway, this is a fun and easy recipe to make. They're a bit different from the typical pumpkin cakes and drinks and they make a yummy hostess gift for fall parties. A quick word of advice: watch your temperature very closely and make sure you stir, stir, stir to prevent scorching. 1 can sweetened condensed milk...14oz. Prepare a 9-inch square pan by lightly buttering it. Or, you can cut a piece of wax paper to place in the bottom to make removal easier if you'd like, but make sure you still butter the sides. In heavy 2 to 3-quart saucepan, melt butter over medium heat. Add sugar and spices: thoroughly blend. Add corn syrup, sweetened condensed milk and pumpkin stirring well after each addition. 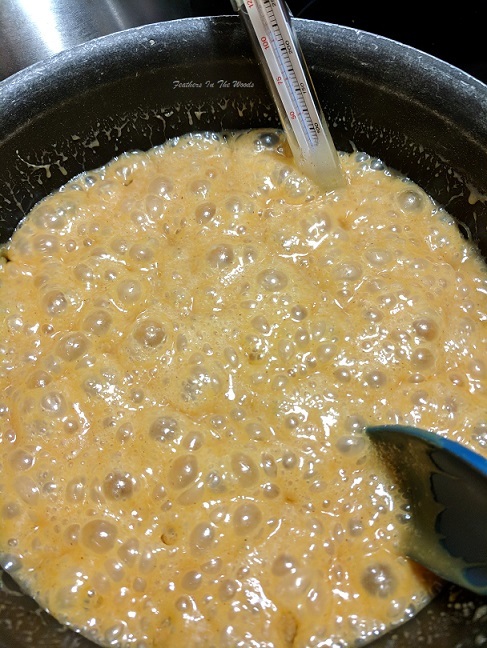 Continue to cook over medium heat stirring frequently to prevent scorching until the temperature of the mixture reaches 248°F (firm ball stage). Remove from heat and pour mixture evenly into the prepared pan. 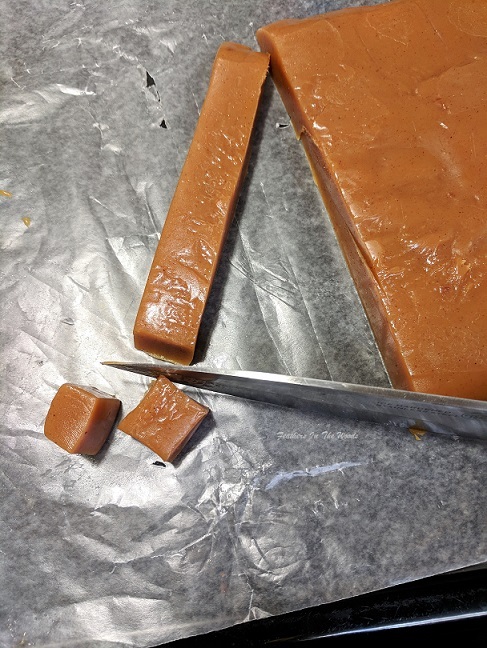 When cool, turn candy out of pan and use a sharp butcher knife or buttered kitchen shears to cut candy into 3/4" squares. I prefer a butcher knife but any sharp, heavy non serrated knife will work fine. Wrap pieces in 3" squares of wax paper or layer in candy boxes using wax paper between layers. Store in an airtight container. Keeps for a few weeks...but I doubt they will last that long. They are sooo good! That's it! Pretty simple huh? I love making things from scratch and using simple ingredients. I also like knowing that there isn't a gazillion additives in the treats I make...and I'm a candy junkie! Oh...My...Oh...My!! Your caramels look sooooo good! I love pumpkin anything!!! Great idea! Pumpkin anything is fabulous! Pinning to try! Thanks for sharing! I love anything pumpkin! Can't wait to make these! These sound delicious! They may be going in my FIL's Christmas cookie container this year. :P Pinning! Found you on Say G'Day. Thanks for sharing! That looks so yummy! Its the first time I ever heard of pumpkin caramels. These sound fun for fall! Found them at the #SayG'day Linkup. pinned! How fun! I make licorice caramels for Halloween. These would be delicious for a little take home treat for Thanksgiving guests! Thanks for sharing with SYC. Thanks so much for sharing your recipe at the Say G’Day Linky Party. I’ve just shared your post on Pinterest/Twitter/Facebook. Best wishes for a great week! Love pumpkin recipes and anything candy ! Thanks for sharing. This would be great to give as gifts. Can you just use sugar or brown sugar instead of corn syrup? I know you can make other kinds of caramel with regular sugar instead of corn syrup. I just don't like buying another ingredient (for only one use) when I have plenty of sugar all the time and it has many uses. Any way, I'm pinning this recipe. Oh, these look so good for the pumpkin lovers in my family. I have never tried to make caramels, but I may just have to try now. Thank you for linking up to the Country Fair Blog Party this month!